A good old adage that the majority of us food lovers happily embrace, despite knowing the consequences is also one that puts fear in mindful eaters. I know this because I have gone through bouts of mindful eating. Thankfully, those days were far and few in between. These days, I am blissful staying ignorant. Even Friedrich Nietzsche himself agrees, “That which does not kill us makes us stronger”. I like Nietzsche, I think he understood us food lovers best. My Dad too, will agree. After all, he never let up trying to convince my siblings and I on how eating the fatty bits of any meat is never a bad thing. “You’re growing, you need energy, eat the skin, it’s good for you,” Dad instinctively chimes whenever he sees me separating the skin (and fats) from any meat that I was eating. As always, I would expect like-minded food lovers to protest when I say that I hardly ate the fatty glorious tasty skins of chicken, pork and duck. You can start rolling your eyes now, it’s okay, because I feel the same way. You see, I’m a bit contradictory in a way. I will not say no to Eton mess (of which there’s tonnes of cream, which equates to fats anyway- a good 30 to 35% eh? ), trifle (again, cream! ), tiramisu (mascarpone cheese, hmm, need I say more? ), panna cotta (self-explanatory), and the sinful list goes on. Why avoid skins when in fact, I cannot get enough of creamy dreamy fat? It’s a really stupid thing to subscribe to. Yet, I’m guilty of that. There, I’ve come clean. Trust me, I’ve had my fair share of raised eye-brows when friends (oh and colleagues and bosses!) see me push fatty bits of goodness to the side of my plate. Somehow, it makes me feel guilty, especially since I’m supposed to love even the sinful stuff, no matter how unadulterated it is. But believe me when I say that it is also mainly because I hardly find skins appealing, both in taste and texture. That said, isn’t it the norm for a true food lover to never say no to delicious fatty skins? Apparently so, considering the number of times I’ve been chided for my nonchalant attitude towards those fatty bits of skin. Glistening skin with a smooth gelatinous-like layer of fat sitting lightly on firm, cold white chicken meat. Every piece was a piece of heaven. If you’ve read this blog before, you might notice that I hardly talk about meat this way, let alone chicken skin. Some days I might exaggerate, but today, I am presenting it to you plain and simple. I love sharing good things anyway. The place selling this unctous chicken is not unknown. Many local food bloggers have blogged about it, including Leslie. Shame on me for not picking up on it and trying it earlier. It was not until a friend of mine shared about how this chicken skin was the stuff of his ultimate food fantasies, that I caught on. He insisted that I had to try it. Honestly, I wasn’t sure how much I was going to like it. Chicken skins are just chicken skins, no? Apparently not. I was wrong to judge them all as equal. 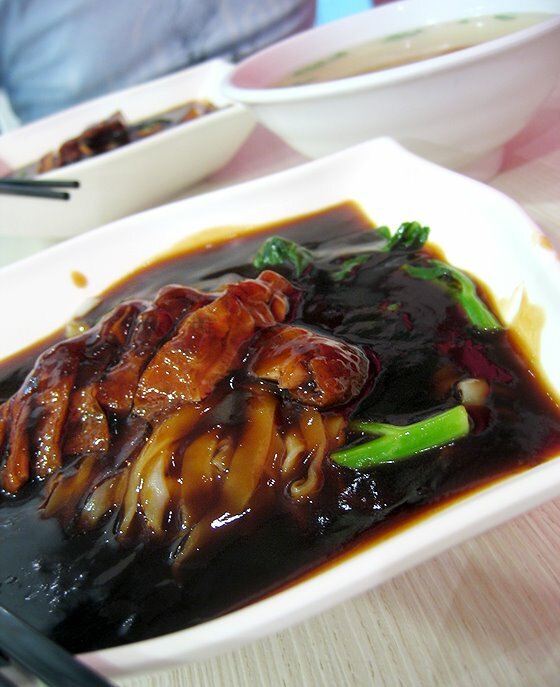 Yi Bao’s Ipoh hor fun comes with a very generous helping of their oyster-sauce-based (a wild guess, do correct me if I’m wrong) dark midnight-brown gravy. 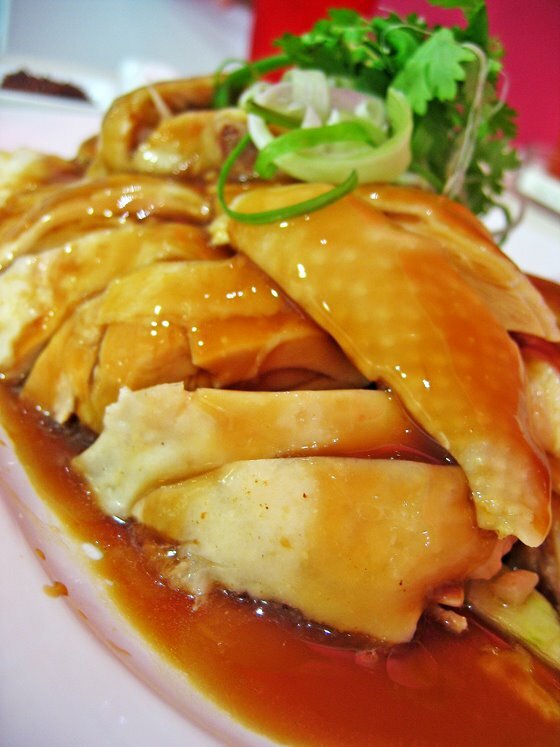 Coupled with the cold white chicken with its gelatinous skin, this dinner at Yi Bao is one to remember. It would be the day I fell in love with chicken skin, white chicken skin, something I used to push to a corner of my plate. I am thankful to my friend, my ever zealous foodie partner-in-crime, for bringing me to this place, a place which convinced me more than ever that whatever which does not kill us, only makes us stronger, no matter what the doctors or medical journals say. No one ever died of indulgence. At least no one I know. Ignorance, my friend, is bliss. Somehow I can’t seem to appreciate fatty skin as well although I eat my share of bad fats via all my cakes and desserts. I’m the only person who bites/cuts off fish skin when I have fish and who does that? It seems that I only appreciate fats in the form of dessert. this place is truly underrated. 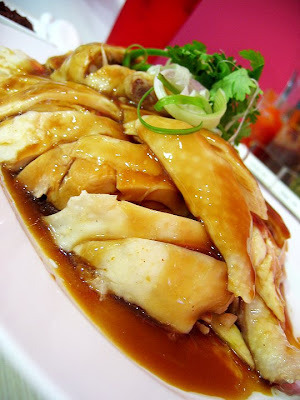 is good for white chicken and soy sauce chicken. I myself do not eat White Chicken skin hehehe. But I cannot get enough of fatty foods like Chocolates and blah, sinful!! The Yi Bao Hor Fun is good, especially with their chilli!! i really loved eating there since i was very young. Great cold white chicken , my favourite!